Tarot of Stars Eternal a reworking of the Aleister Crowley Thoth Tarot, by artist Andrea Serio who also designed the Dante Tarot. 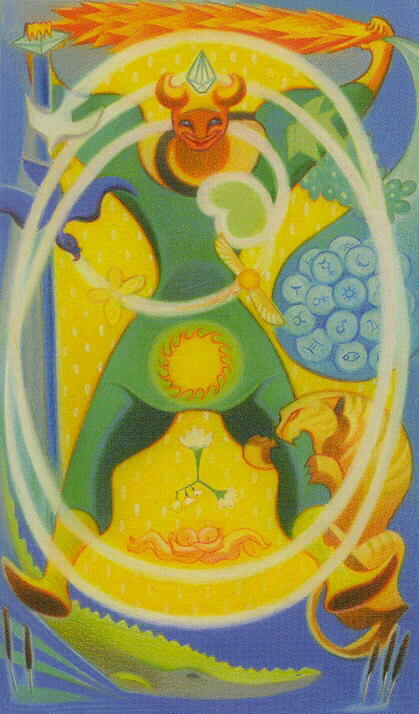 Compared to the Crowley Thoth, the art is softer, more unfocused, more flowing and abstract. The pen-and-ink fractured detail of the Crowley deck has been removed, which gives the art a more flowing and dreamlike feel but precision and raw-edged reality is lost. The Numbered Arcana cards are where the Tarot of the Stars Eternal departs significantly from the Thoth blueprint. The astrological and stellar correlations appeared only partly in Crowley�s version, and with this deck they have been taken to a higher level of development.